To celebrate the unexpected snow day today, Gabby, Melody, and I met up early to trek to Fatih to sample the Turkish treat boza. 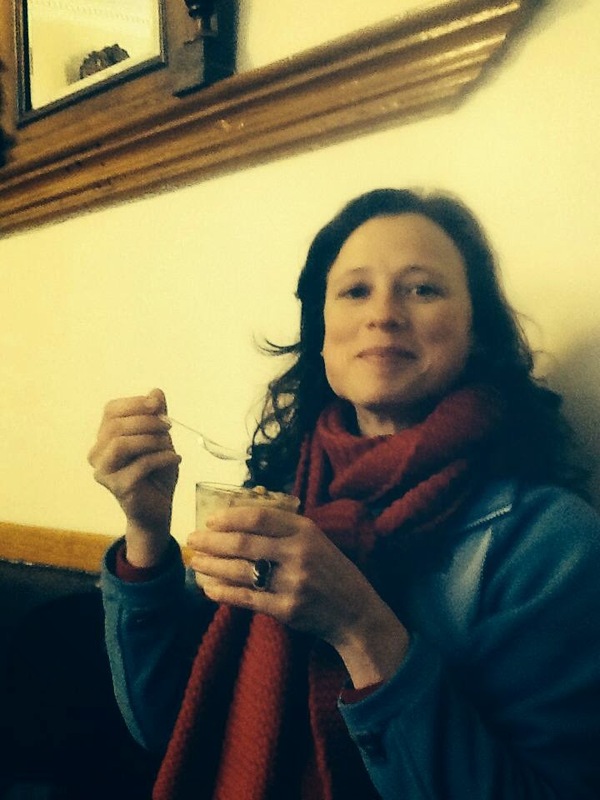 I had mistakenly thought that it was served warm, which had sparked the initial motivation to go on a snowy day. We headed to Vefa, a well-established boza place and the neighborhood's namesake, that Gabby had been to previously. Minutes into our walk, my cheap boots were drenched in ice water and my feet were starting to feel numb. It was quite a relief when we made it to our destination, where I quickly peeled off my soaked boots and changed to an extra pair of socks that Melody had brought along. We sat on the cushioned booths in the far corner and shed our layers around us. Vefa was established in 1876, as it proudly displays on its sign, and it seems to have been marvelously frozen the elements of a bygone era. Its wall is lined with a mirror that, from our angle, reflected the elegant windows housing multicolor bottle displays. Across from the mirror, spread a long, wooden bar with ready-prepared cups of boza awaiting customers. Ornate Turkish tiles framed the bar's shelves and oil paintings of the city adorned the walls. 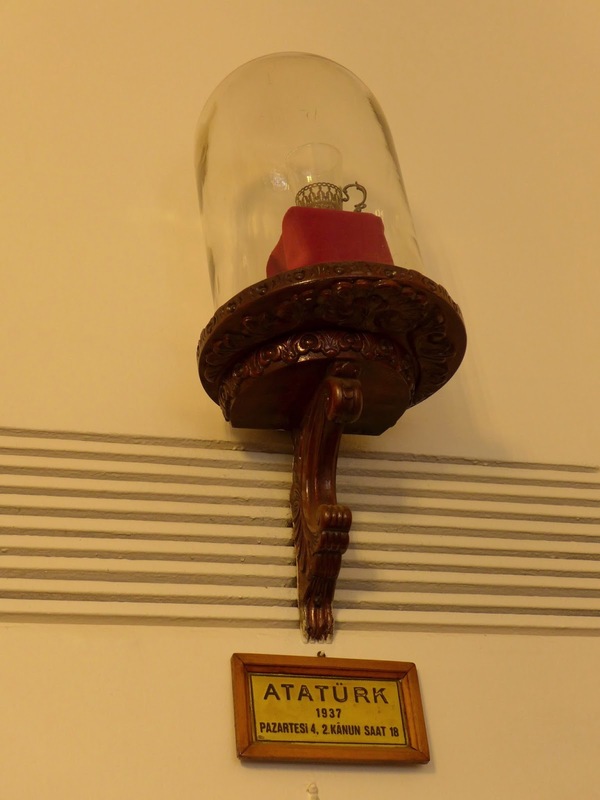 Behind were we sat, a glass used by Ataturk was preserved in a glass case like a religious relic, along with a plaque commemorating the date and time of its use. I sat in the nest of our coats with my icicled feet underneath me and Gabby graciously went to grab us some of these cream colored, cinnamon-dusted treats to try. They are often eaten with a generous helping of roasted chickpeas that can be purchased from a store across the street. A woman sitting close to us kindly shared hers with us, pouring a bumpy hill on each of our cups. The boza reminded me of applesauce in its slight sour sweetness and the mixed in chickpeas gave it a satisfying crunch. Its miniscule alcohol content wasn't enough to heat us up, but it was definitely tasty. We stayed a while longer, mentally preparing to go back into the cold and taking in the retro decor. When it was finally time to go, I wrapped my cold feet in plastic bags at Melody's suggestion, and slid them back into my dripping boots, hoping it would carry me for the rest of the day. We stepped back out into the cold. Vefa is the kind of neighborhood where any path you take, you will smack right into an ancient structure. 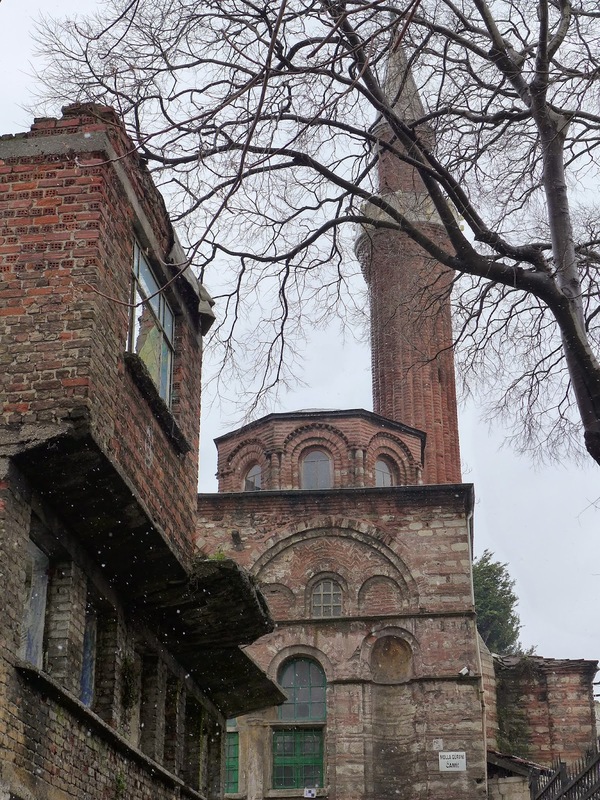 We took a few turns on the streets around the boza shop we spotted the beautiful Byzantine brickwork of the Molla Gürani Camii and were immediately intrigued. 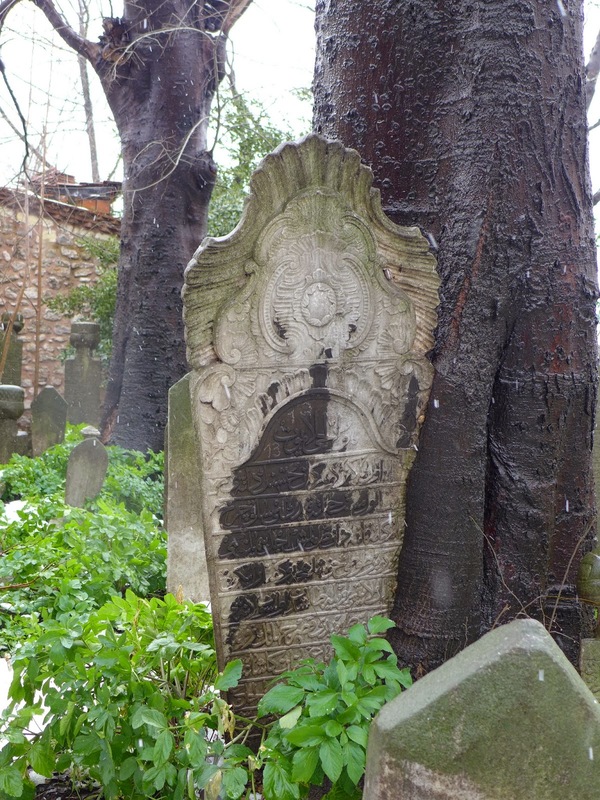 On our way up the street, we stopped to admire the cemetery, populated with timeworn tombstones of varying sizes, leaning this way and that, like villagers mulling around a town square. 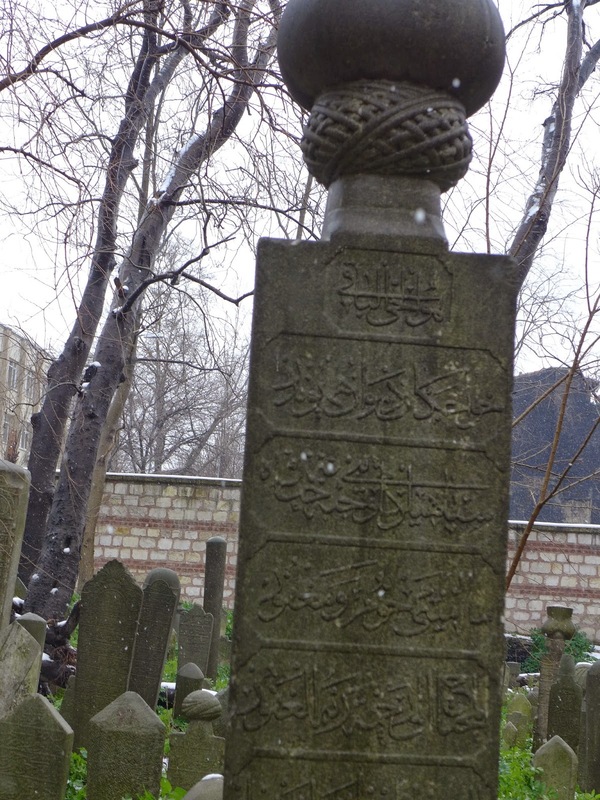 Each tombstone had individual adornments, topped with turbans for men, and decked in carved flowers for women, with Arabic writing on their stone torsos. We continued up to the cami, with its elegant brickwork and echoing arches. We found that we could go into the front area without taking off our shoes, which I was thankful for, since putting them on with the bags had been a bit of a struggle. The inside was a surprise and equally breathtaking. A collage of old and new, the mosque has retained the ancient framework of the church it once was, but has had the functional components for a mosque added to it. Ancient marble columns with leafy corinthian tops frame the doorway to the inside of the mosque and ribbed domes with remnants of Byzantine mosaics rise up the ceiling. They are not nearly as well preserved as the ones in Chora... barely preserved to tell the truth, but the unexpectedness of seeing any mosaics there made them feel like we'd found sunken treasure. The chill had buried itself deep inside my skin and my feet felt submerged in ice puddles. I stepped outside right as the imam of the mosque began the call to prayer in a beautiful, melodic voice. Soon, the call from the surrounding mosques chimed in at slightly different times, joining to create an ethereal sound, both moving and captivating. I froze, not wanting to break the spell.